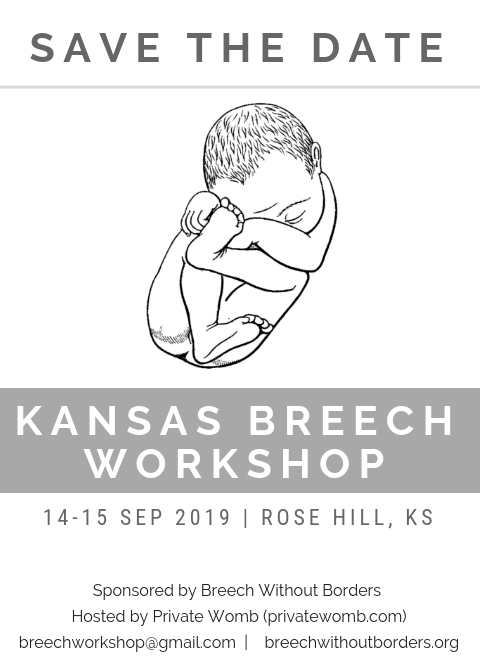 Breech Without Borders is pleased to announce a breech workshop next September in Rose Hill, KS! 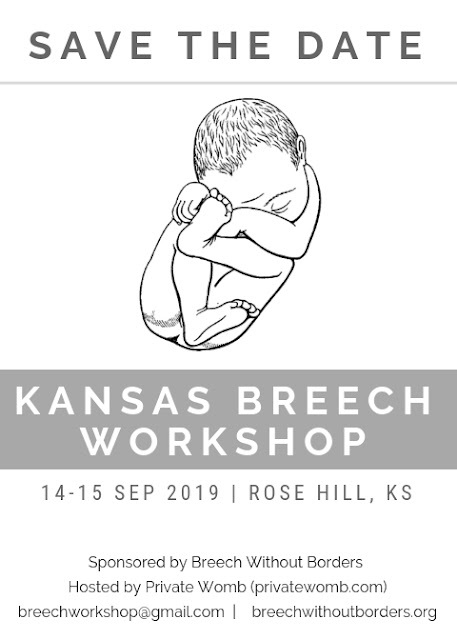 Who wants a breech workshop in their area in 2019? I'm excited to share a guest post from filmmakers Jacob ; Honey Hesmondhalgh-Scott of Honey Bee Pictures. They are crowdfunding to support their newest documentary project. Off the West Coast of Scotland lies some of the most remote islands in the UK, the Outer Hebrides. With a rich cultural history, beautiful landscapes and a peaceful way of life, many thousands call these islands their home. Living here comes with its own set of joys and challenges, but how does remote and rural midwifery impact a person’s pregnancy? Especially if you’re unable to give birth on the island you call home. A new feature documentary, currently in production, explores exactly this. 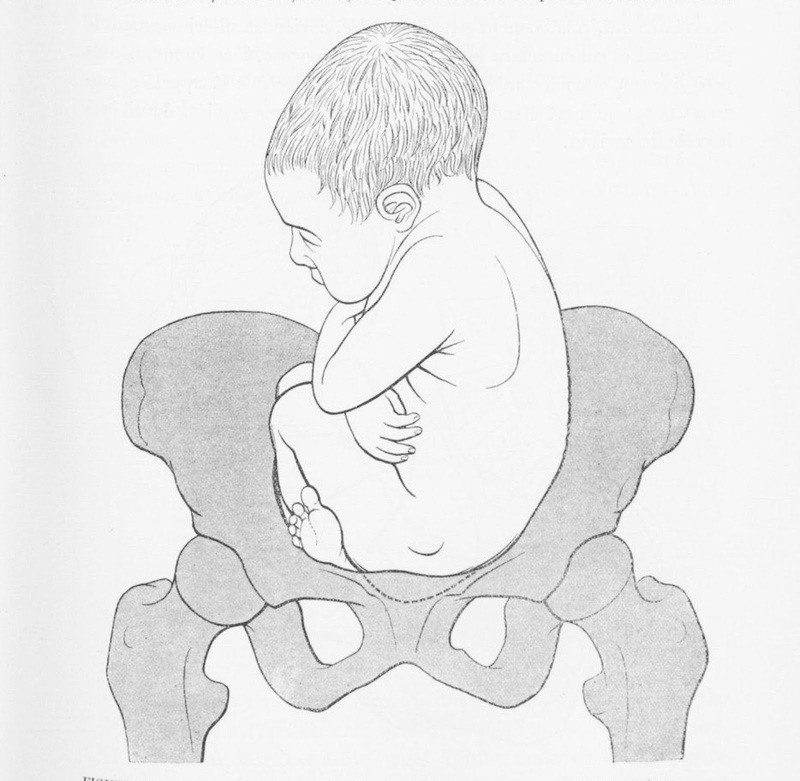 It gives insight to the complications of pregnancy and birth in the Outer Hebrides and forms a portrait of the only midwife on the remote Isle of Barra. Hebrides Midwifery Documentary - Trailer from Honey Bee Pictures on Vimeo. On the Isle of Barra, Veronica, the island’s only midwife, expects 10-15 births per year, from a population of around 1,000. However, with no childbirth facilities on the island, all women leave at 38 weeks and travel to a hospital of their choosing to deliver. Meaning they could be away from home, away from family, for up to one month. This upheaval can cause emotional, financial and physical stress. Though the NHS does provide some reimbursement, this never covers the costs in reality of moving a family away from their home. The subsequent communication between hospitals and health boards, the crucial timing of the trip, the wellbeing of child and expectant mother, all falls to Veronica. Previously a senior maternity co-ordinator in Lanarkshire, Veronica has been a midwife for 30 years. Having dreamed of one day living and working in the Hebrides, 18 months ago, this became a reality and Veronica stepped back into community midwifery. On an island with no obstetricians, gynaecologists, ultrasound equipment or labour ward, a tremendous amount of responsibility lies on veronica’s shoulders. This independent documentary creates a striking portrait of life in the Western Isles--travelling with couples off the island across their pregnancies, flying out from the only airport in the world that lands on open beach, and learning first hand the realities of starting a family in the remote and rural Western Isles. We hope to screen the film all over Scotland and the UK, in educational settings for universities and hospitals, international film festivals and online streaming platforms. In other lovely news, Veronica has just been nominated for the Scotland Maternity and Midwifery Festival Achievement Award in recognition of her contribution to maternity services. If you’re interested in supporting the film and keeping up to date with the production, we are crowdfunding to allow us to keep making the film. Over Thanksgiving weekend our kids watched several episodes of The Great British Baking Show. This inspired a round of baking today. We made a party bread stuffed with pesto, roasted butternut squash & onions, pine nuts, & sheep cheese feta. Then we had a judging contest with Eric filling in for Paul Hollywood. 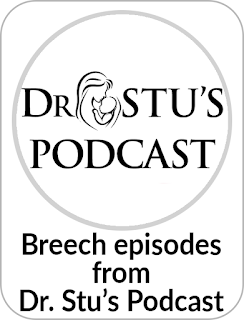 Listen to my interview about breech birth with Tracy Donegan! 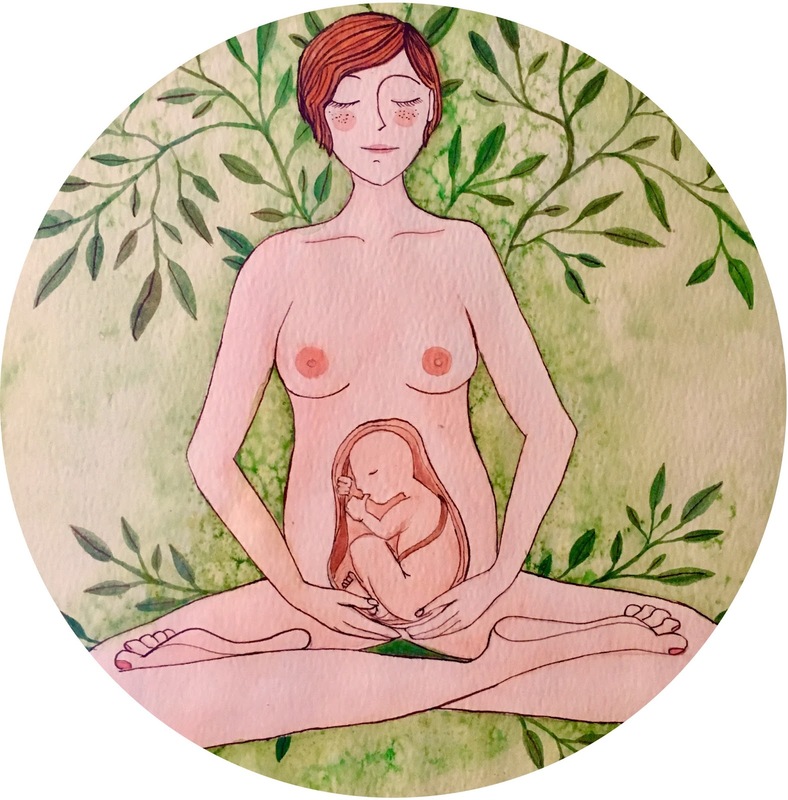 Tracy trained as a midwife in Ireland and currently runs GentleBirth. The podcast is also available here on iTunes. 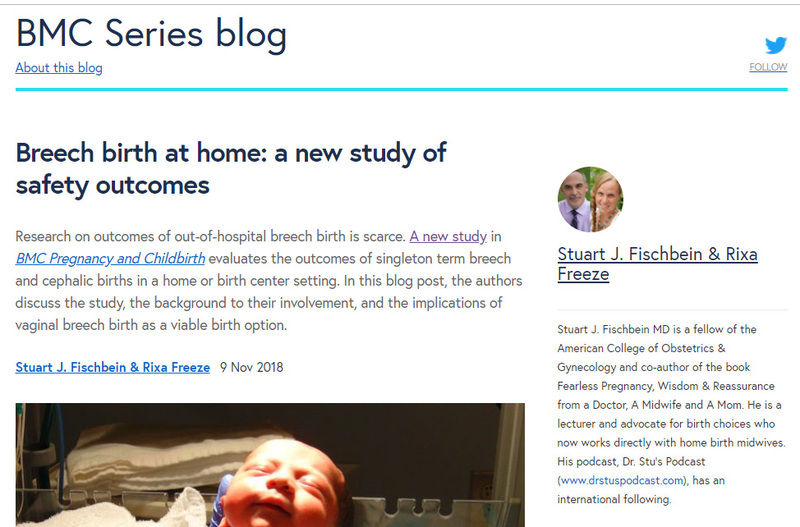 Dr. Stuart Fischbein and I were invited to write a guest blog about our recent article in BMC Pregnancy & Childbirth, Breech birth at home. 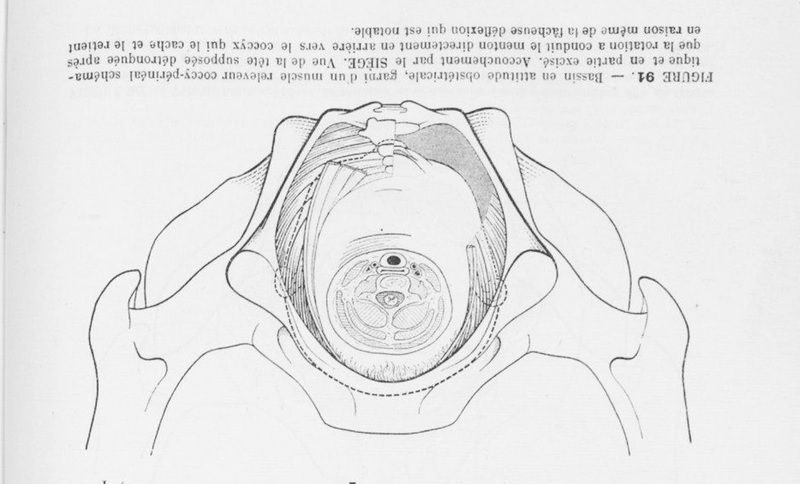 We are doing women enormous harm by taking away their bodily autonomy when their baby is breech. In theory, state and federal laws support the principle of informed consent and informed refusal, and nearly every hospital has a patient’s bill of rights that ensures consent before medical procedures. Yet we throw these legal and ethical rights away when a baby turns bottom-first. We can do better. We owe it to the women we care for. Women should not be forced to leave the hospital in order to exercise their right to informed consent. 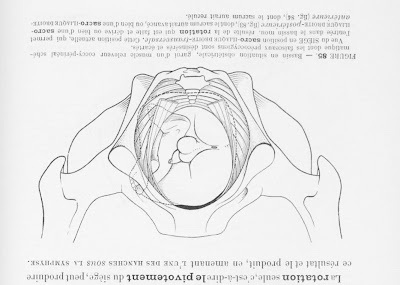 Every woman with a breech baby deserves access to skilled providers in her own community who can support her, whether she chooses a planned cesarean section or a vaginal breech birth. Come listen to Dr. Stuart Fischbein discuss our recent paper Breech birth at home. 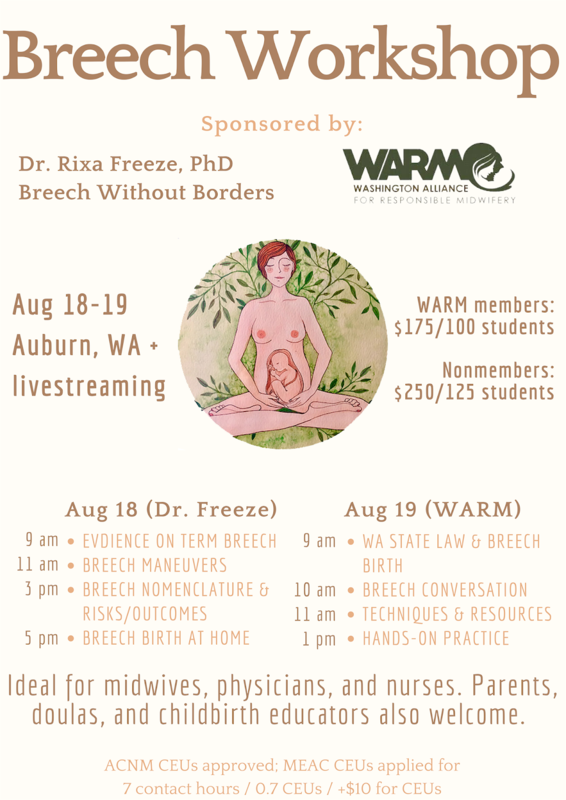 A 2-day workshop on vaginal breech birth with Dr. Rixa Freeze, PhD and Dr. David Hayes, OBGYN of Harvest Moon Women's Health. If you are on call or cannot come in person, the event will be livestreamed and recorded. 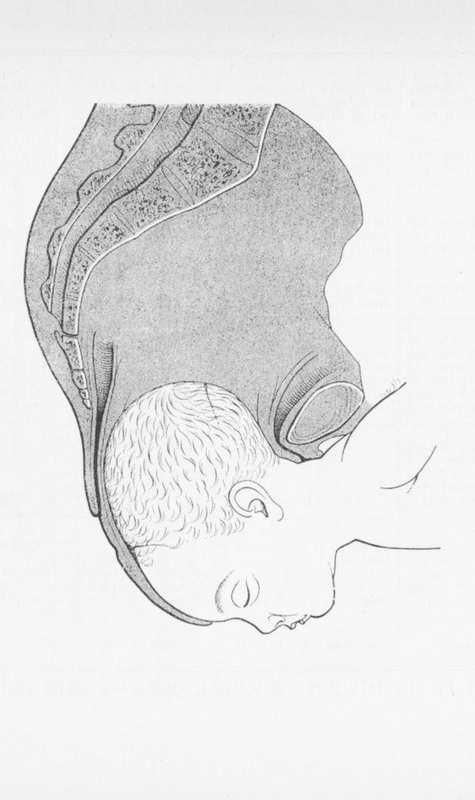 After being under consideration for a year, our article on breech birth at home was finally published! 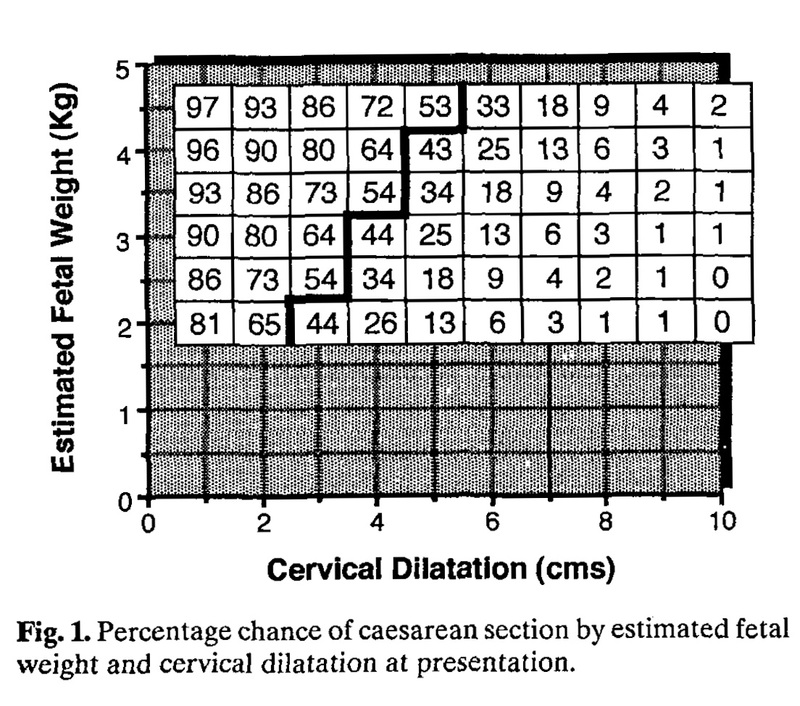 Dr. Stuart Fischbein and I analyzed the results of 60 breech and 109 cephalic pregnancies under his care. 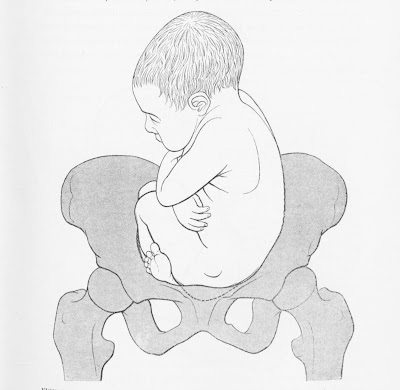 Most took place at home and some in a freestanding birth center. 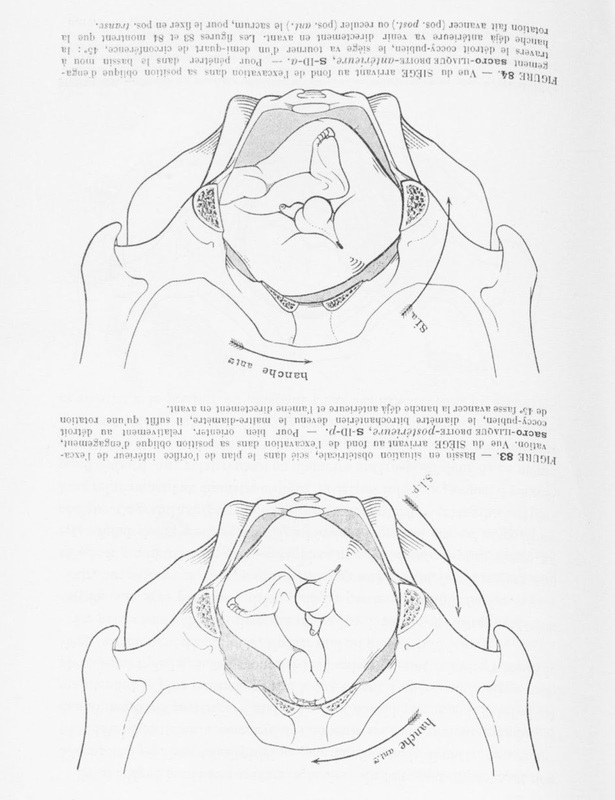 We chose to pay for open-access publishing so that our article would be accessible to anyone free of charge. If you'd like to help support our work, please consider donating at our GoFundMe page. 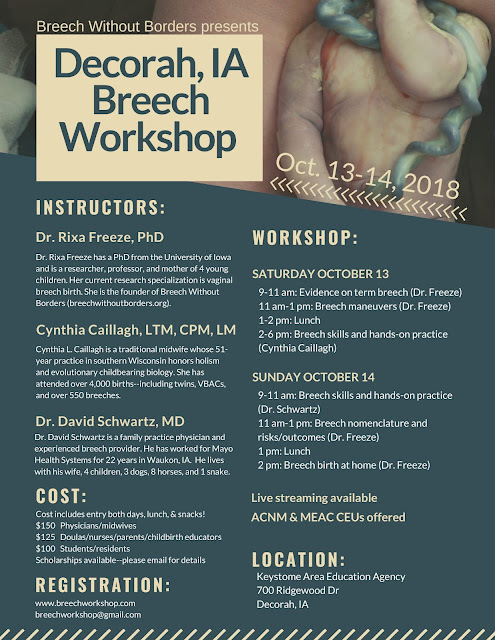 Announcing a Breech Workshop in Decorah, IA on Oct 13-14! 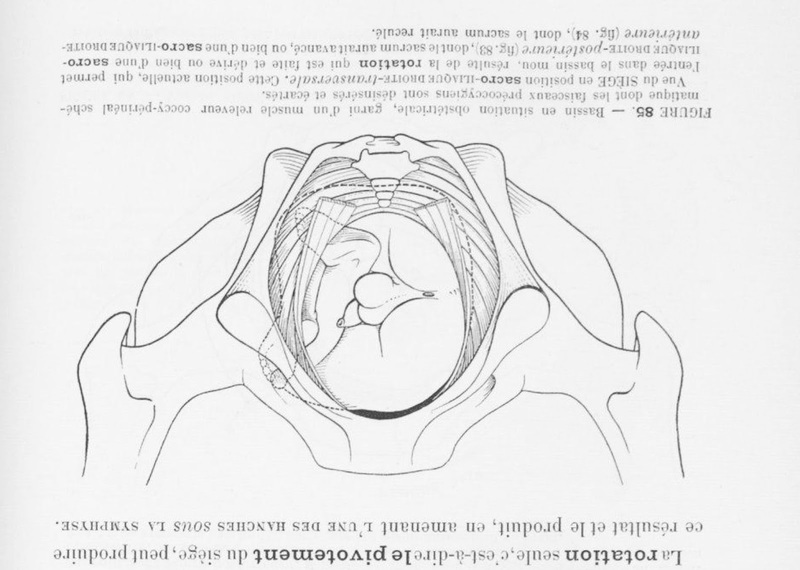 Please spread the word so we can re-teach breech. 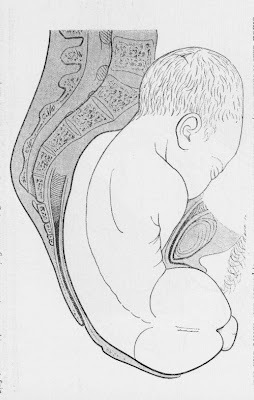 I will be giving 4 lectures: evidence on term breech, breech maneuvers, breech nomenclature & risks/outcomes, and breech birth at home. We have also two fantastic instructors for the hands-on skills portion. Cynthia Caillagh, with experience attending over 550 breech births, and Dr. David Schwartz, a family practice physician in Waukon, IA. Livestreaming will be available if you cannot come in person or if you get called away to a birth. ACNM & MEAC CEUs available. This semester I am teaching a class with the theme "Exploring the Limits of the Human Body." 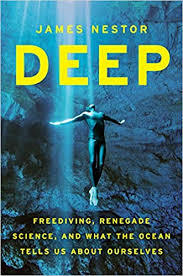 We are currently reading Deep: Freediving, Renegade Science, and What the Ocean Tells Us About Ourselves by James Nestor. This book is a fascinating narrative that combines ocean exploration, marine biology, competitive and research freediving, and dormant human abilities that originate in our deep oceanic past (the mammalian dive reflex, magnetoreception, and echolocation). When freedivers experience a blackout--usually near the surface at the end of their dive--they still remain responsive to sound. 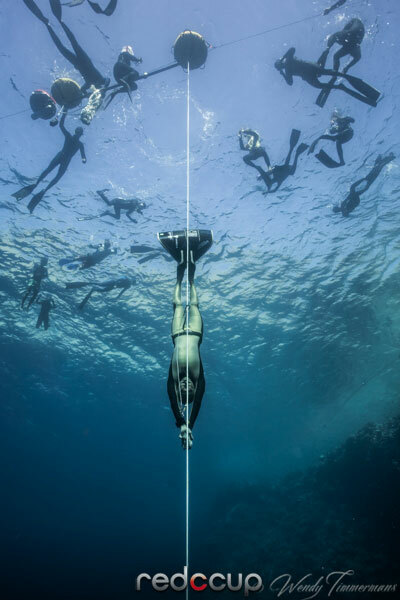 After pulling the unconscious freediver to the surface, the safety team will call the diver by name and tell them to breathe: "Breathe, Alexy, breathe! Breathe, Alexy, breathe!" From my time in the home birth world, I often heard midwives talking about how they involve parents in neonatal resuscitation. A common practice is to have one of the parents speak to the baby and encourage them to breathe. I had always categorized this practice as a nice idea. It certainly wouldn't hurt, right? 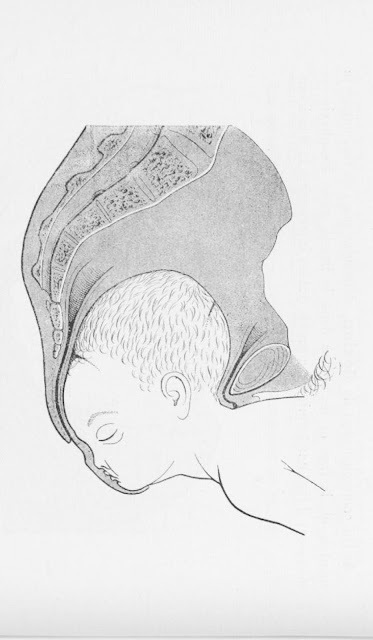 In fact, I did it instinctively when Inga was born; she lost color and tone after about 30 seconds and needed mouth-to-mouth. While I was resuscitating her, I was talking to her and encouraging her to breathe. However, I never thought that there was a scientific or physiologic reason for calling the baby by name and telling them to breathe--until I learned about freediving. Even when all of their other senses are offline, a blacked-out freediver will still respond to sound. Calling a baby by name and telling them to breathe, especially when done by a familiar voice, isn't just fluffy woo-woo. 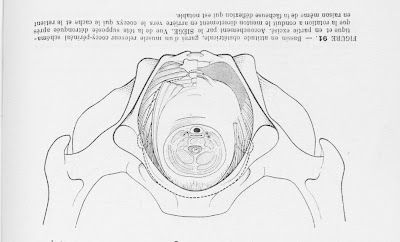 It's part of our basic physiology. This was a lesson in giving more respect to the instinctual or "homespun" practices that have evolved with midwifery and home birth. How many other traditions have yet-to-be-discovered science behind them? These are my hours. Let them be hard. I’ll ask for what I need. This is one of the few lines of narration in the entire documentary These Are My Hours. Filmed entirely during one woman's labor, it is the first of its kind. I'm not one to use hyperbole, so when I say that this film was revolutionary and ground-breaking and magnificent and shattering, I mean every word. The cinematography was stunning, capturing angles and moving shots that would have been nearly impossible to choreograph--even to imagine. And let's not forget the key reason behind this film's success: Emily Graham. Her expressive face and body. Her self-monologues that range from soulful to comedic. Her deep physicality and instinctuality. Her ability to make me feel like I was there, not just watching her but there, inside her body, living the experience. I loved that the film didn't end right at the baby's birth. Instead, we watch Emily adjust to her new body and come back to herself. We see that birth is a process with an ascent, a peak, and a descent. 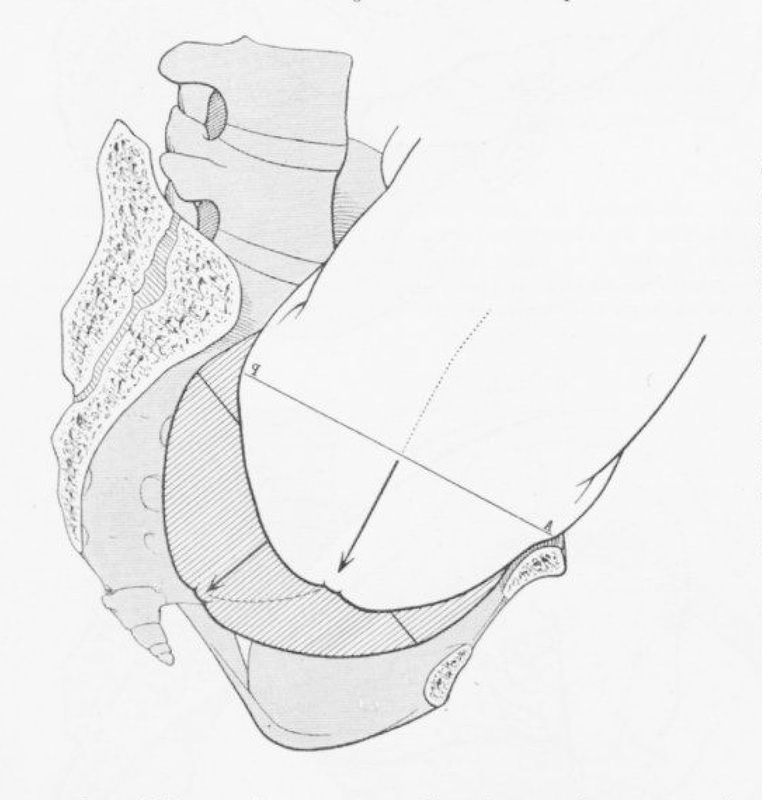 All three steps require navigation and integration. The descent can be just as beautiful as it has the weight of the entire experience behind it. The filmmaker had up to 3 cameras operating simultaneously, yet I never once felt like anyone else was in the room. That was a gift and a skill on both the filmmaker's and Emily's part. The music was minimal but exceptionally powerful. And some of the scenes still take my breath away when I think about them. I won't spoil the surprise here, other than to say that you ought to watch the film. Now. It's worth every penny. These Are My Hours is not a documentary about giving birth--it is birth. 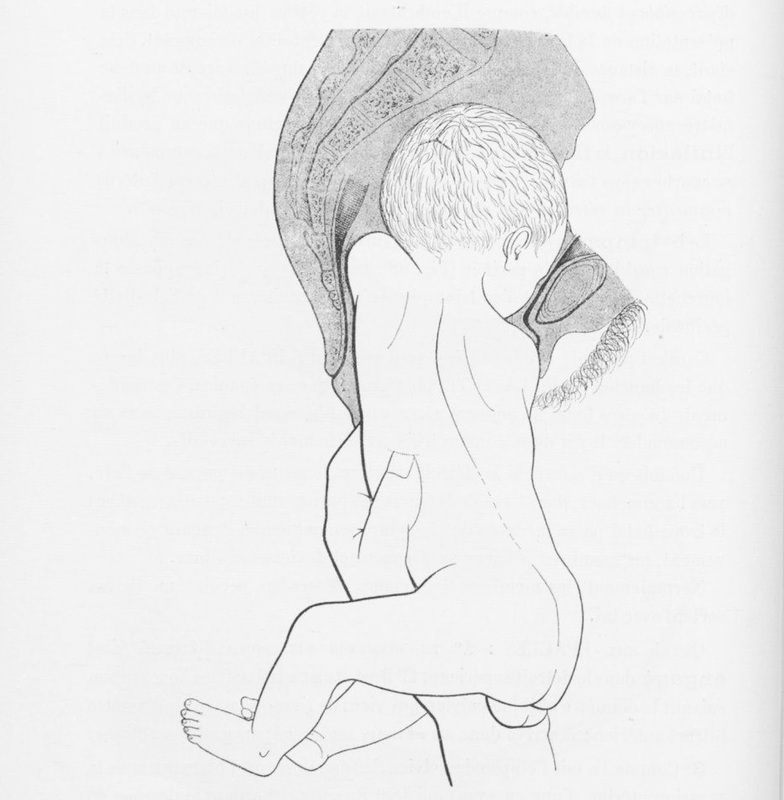 It follows Emily Graham through her labor, birth, and immediate postpartum. Or rather, we journey with her, inside her, as part of her. Besides a handful of narrative sentences and Emily's labor monologue, the documentary is almost entirely wordless. 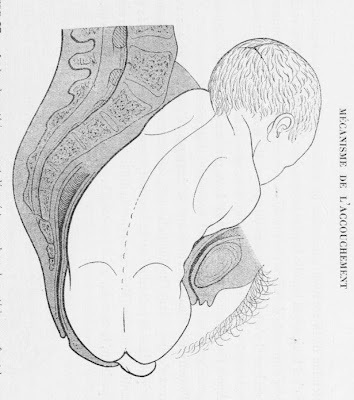 Birth is a process that transcends language and involves all of the senses, so the film's focus on the bodily experience and the near absence of language, interpretation, or commentary was fitting. I still struggle to find words adequate to describe the experience of watching These Are My Hours--a testament to the documentary's success. 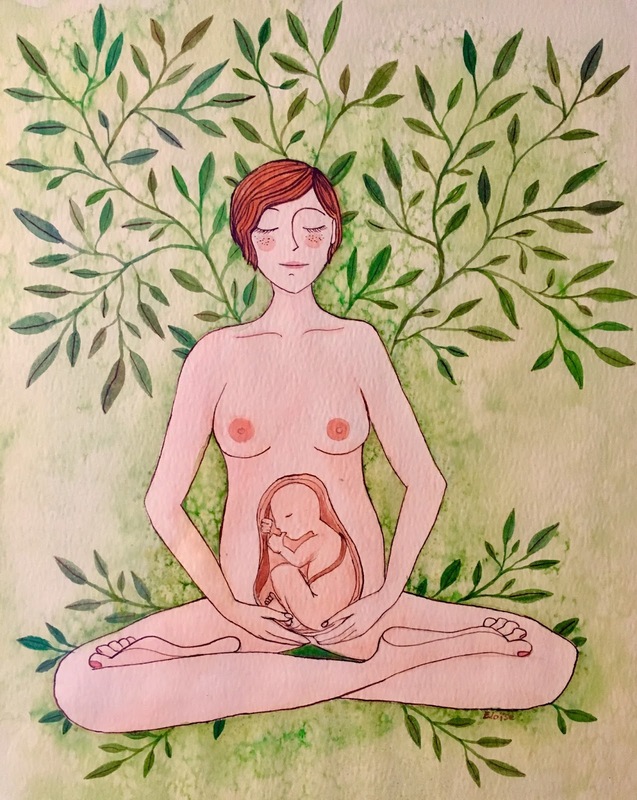 As I watched this documentary, I realized: birth can speak for itself. It needs no champion or interpretation. We just have to be willing to listen. Disclosure: I was not paid to write this, and I purchased access to the film myself. A smile full of new teeth coming in, boundless energy and enthusiasm, solitary at times, talkative at other times--that's our Inga. 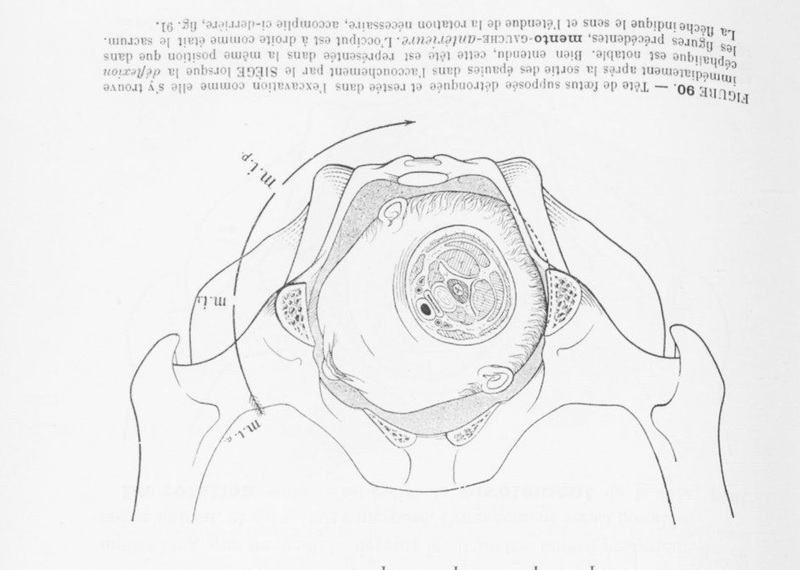 Each year around 6,490 women in the Netherlands (40%) still plan a vaginal breech birth. 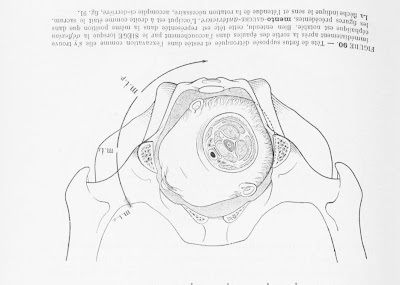 This number is significantly lower than it was before the 2000 Term Breech Trial, where roughly 75% planned a vaginal breech birth and around 50% overall gave birth vaginally to their breech babies (see Rietberg et al 2003). 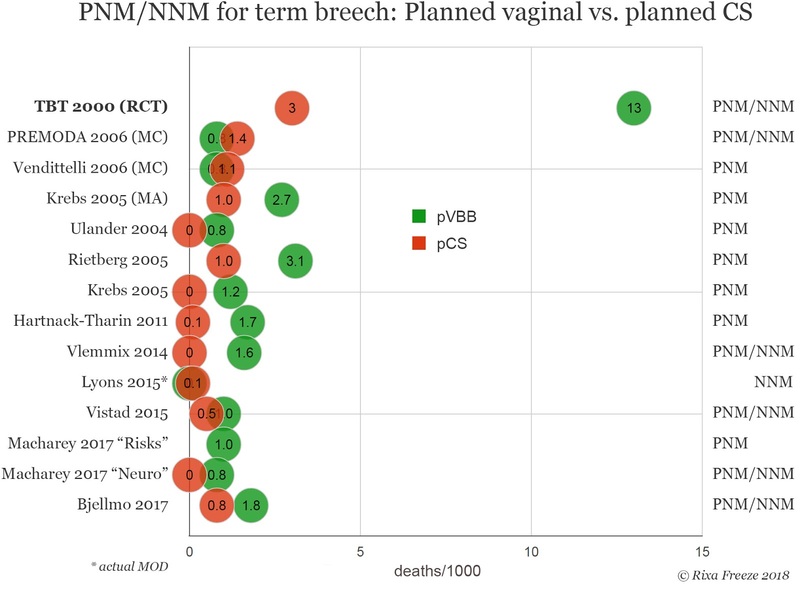 A national registry study by Vlemmix et al (2014) calculated the anticipated neonatal benefits if these remaining 6,490 Dutch women all planned c-sections. 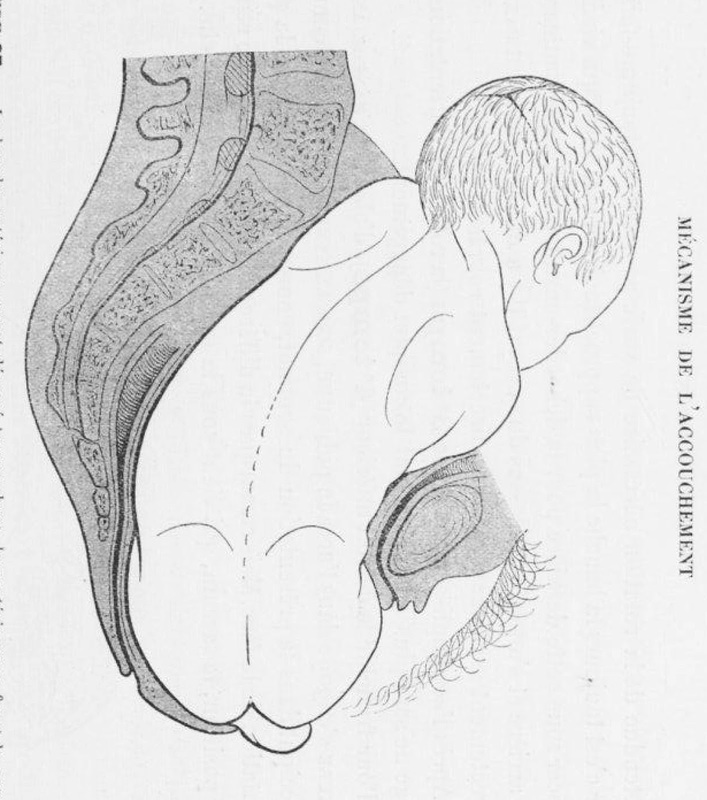 If all women who nowadays still undergo a planned vaginal breech birth were to receive an elective cesarean, 6490 more elective cesareans would be performed. 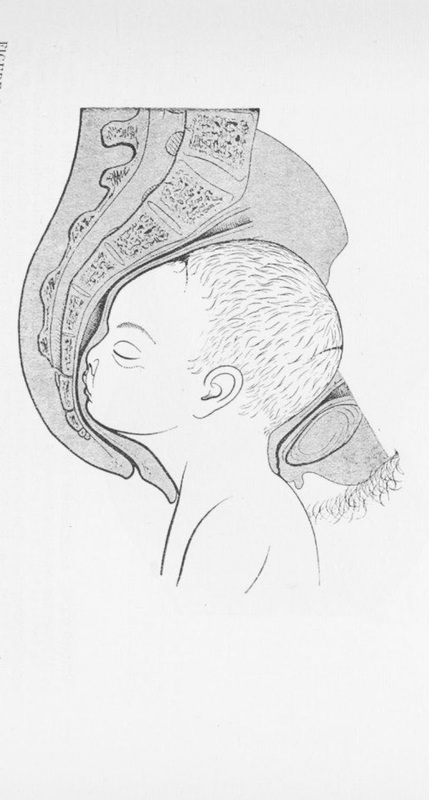 This would lead to an additional annual reduction of 10 neonatal mortalities, 116 neonates with low Apgar scores and 20 neonates with birth traumata. 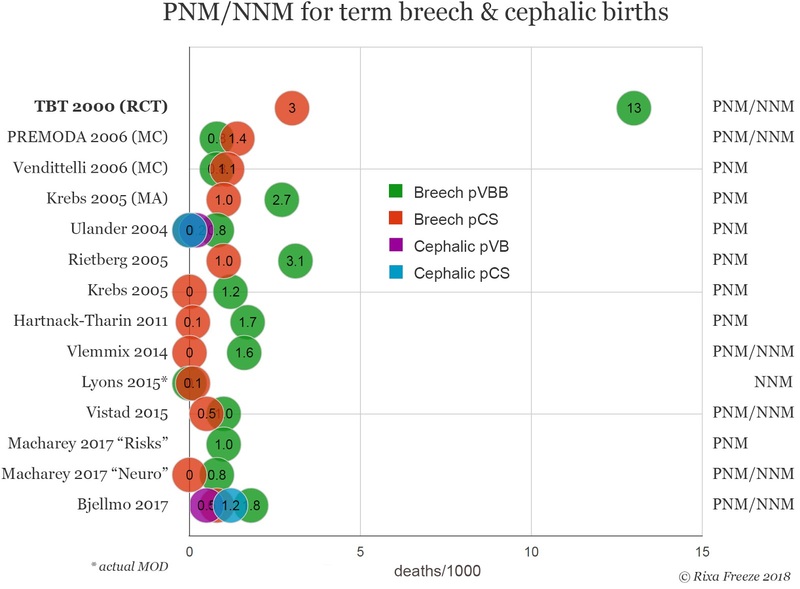 In several national registry studies, planned CS for breech leads to small but measurable improvements in short-term neonatal outcomes (mortality and morbidity). 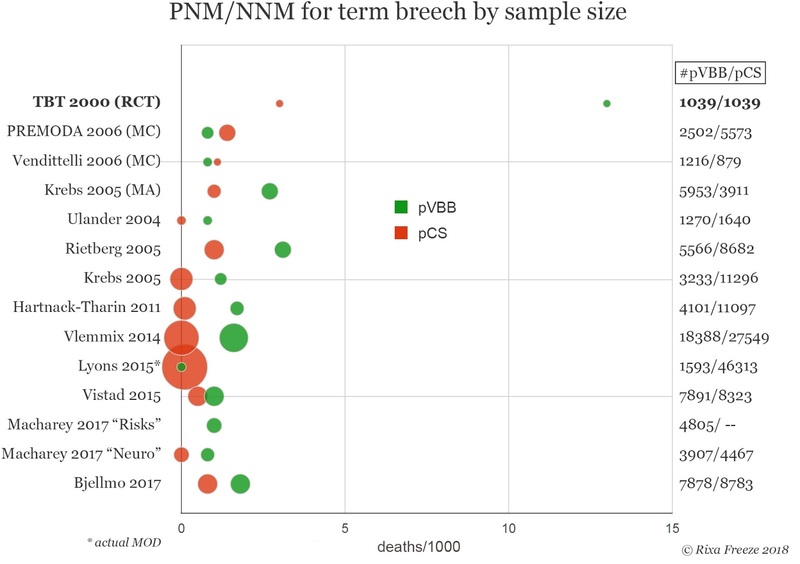 However, these improvements are consistently much smaller than the Term Breech Trial's findings. 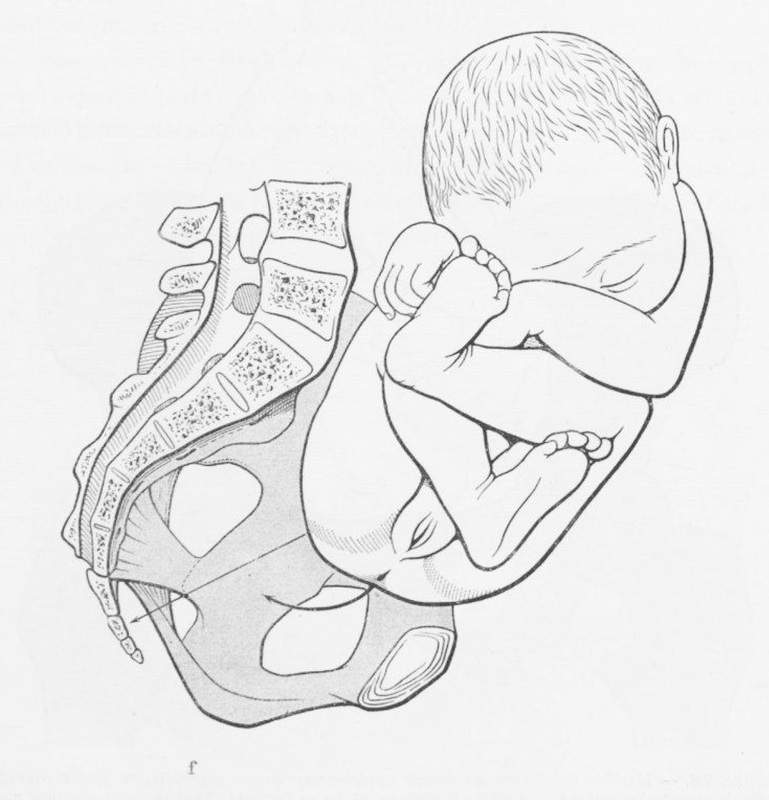 This pressing question remains: at what point do the short- and long-term risks of routine cesarean begin to outweigh the short-term benefits to the baby? 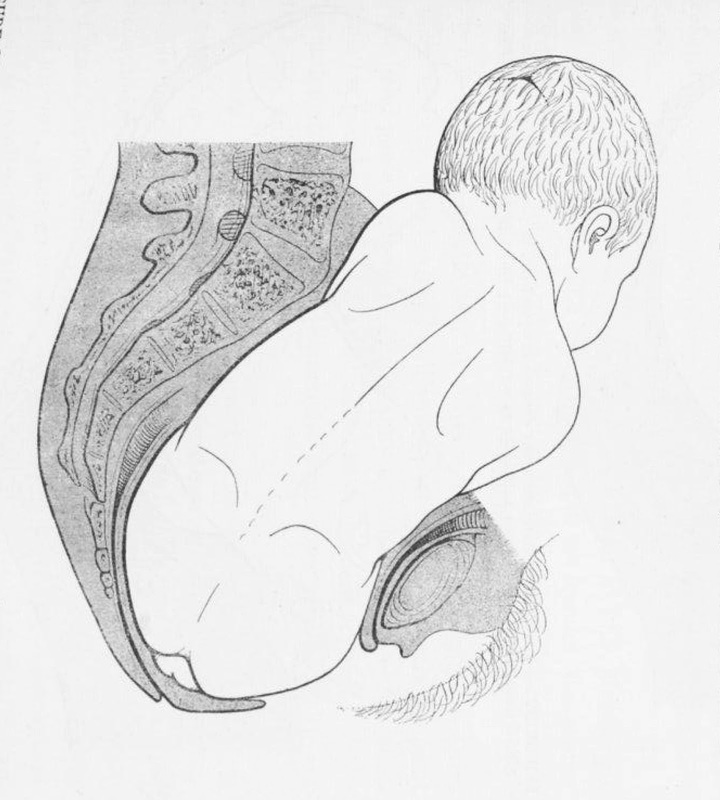 How many elective cesareans are justified to save 1 baby? 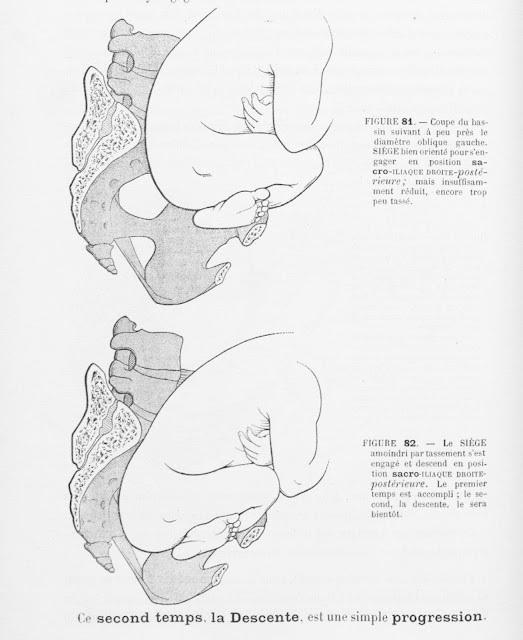 What if women are forced into having these cesareans? 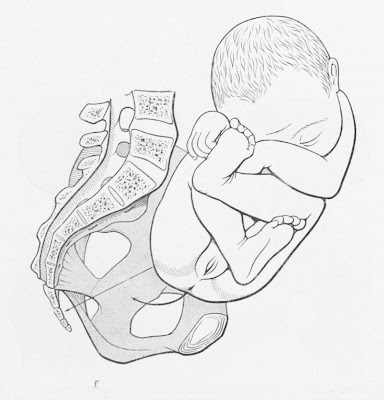 A policy of routine cesarean for breech does not allow women to decide what the acceptable risk/benefit trade-off is. 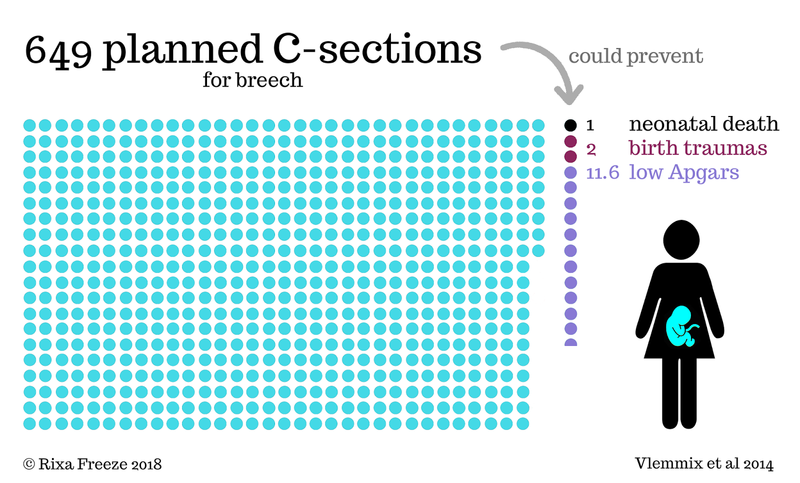 Making a decision about how to birth a breech baby involves a complex risk calculus. Women have to weigh the short- and long-term benefits to themselves, their babies, and their future pregnancies. 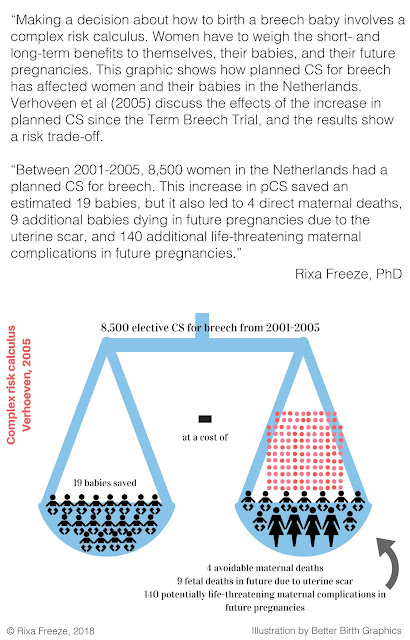 This graphic (created for me by Lauren McClain of Better Birth Graphics) shows how planned CS for breech has affected women and their babies in the Netherlands. 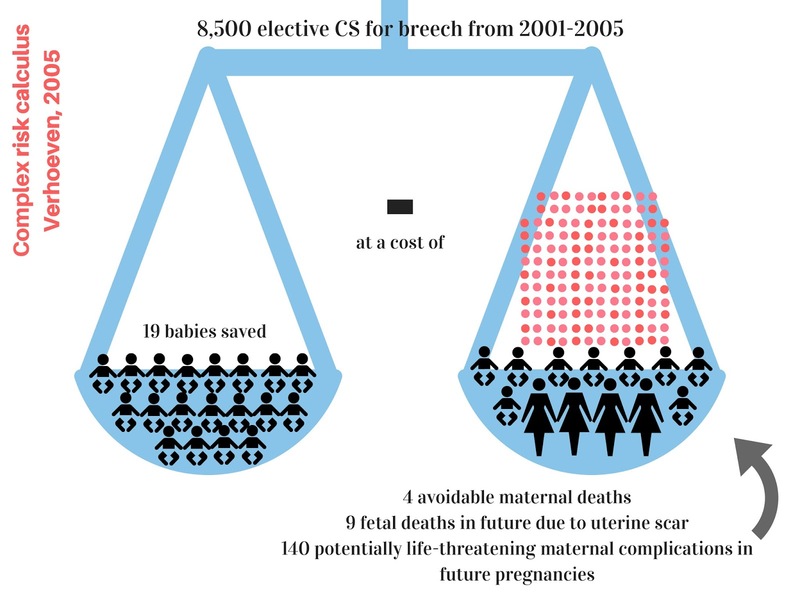 Verhoveen et al (2005) discuss the effects of the increase in planned CS since the Term Breech Trial, and the results show a risk trade-off. 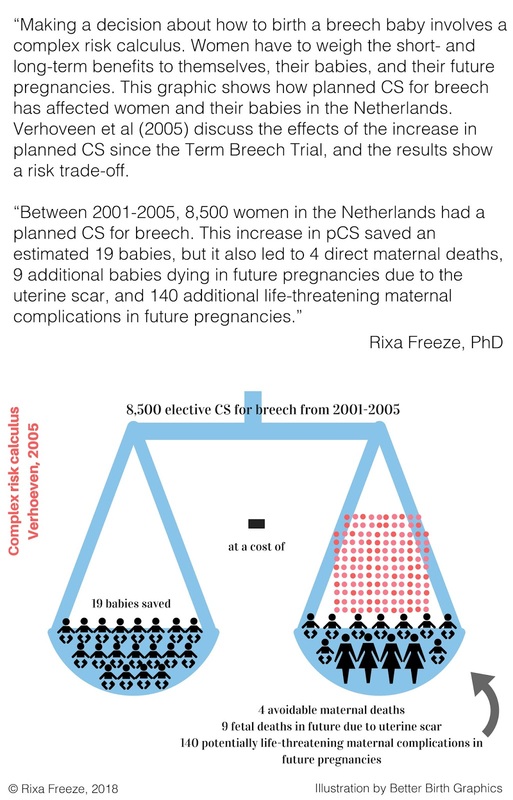 Between 2001-2005, 8,500 women in the Netherlands had a planned CS for breech. 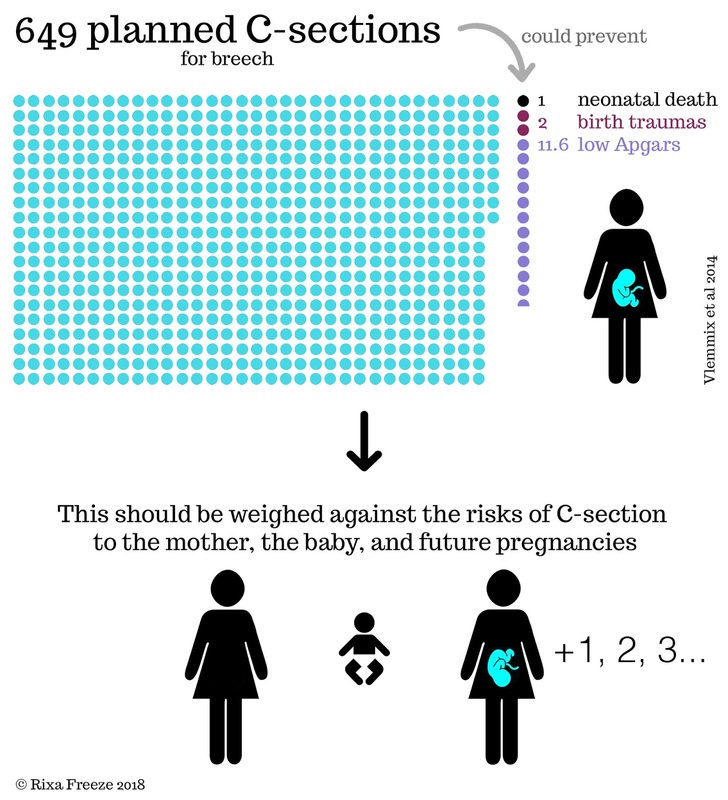 This increase in pCS saved an estimated 19 babies, but it also led to 4 direct maternal deaths, 9 additional babies dying in future pregnancies due to the uterine scar, and 140 additional life-threatening maternal complications in future pregnancies.